Sometimes the juxtaposition of news events is, as one of the major credit card companies says, “Priceless.” This is one of those times. In TechCrunch, Erick Schonfeld put it well when he said “Court Victory for Music Labels Won’t Save Their Industry” in regard to the RIAA winning its first copyright infringement case to go to trial, and getting a $220,000 jury verdict against a Minnesota woman. Over the past four years, the RIAA has sued 26,000 of its customers, but it won’t get the same windfall from all of those cases, since most settle for about $4,000. This was the first to go to trial. So the verdict (if it is not reduced on appeal) sets an important precedent. All the music industry needs to do now is win another 52,000 lawsuits with the same size penalty to match its revenues of $11.5 billion last year. Someone should create some software for the RIAA that automates the serving of subpoenas, because they really have to step up their efforts if they want to save their industry. Or, the industry can spend its time and money trying to find new business models that encourage and profit from the way people actually listen to music today—on their ipods, streaming from the Web, shared among friends and peers. As music goes digital, it becomes more fungible. People are going to do with it what they want because they can. The law may be on the RIAA’s side, but the market is against it. But while the RIAA anchors its hopes on the deterrent effect of lawsuits, recording artists are dropping the record labels like, well, an anchor. 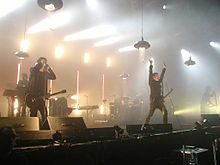 Two days after Schonfeld’s post, the UK Sunday Times Online reported that Radiohead had developed a Priceline-esque “name your own price” model for its newest album. Having waited four years for their heroes to finish another record, Radiohead fans were understandably excited last week to learn that the band’s seventh album, In Rainbows, will finally be released on Wednesday. But what really rocked the fanbase – and heightened the air of gloom enveloping the global record industry – was the news that In Rainbows could be preordered and downloaded perfectly legally for as little as 1p at Radio-head.com. Currently out of contract and thus entitled to dispose of their recordings as they see fit, one of the most popular bands in the world had decided to let the fans decide how much their latest album was worth. An MP3 file of In Rainbows would have no price tag. Honesty boxes, it seemed, were the new rock’n’roll. And the very next day TechCrunch reported that the record industry’s coffin is being sealed Nine Inch Nails. As the incremental cost of providing the goods or services approaches zero, free can actually be a compelling business model. Especially if the fixed costs aren’t that high. That’s why bands are ditching the record labels’ scarcity model and going for a more direct relationship with their fans. Once they’ve recorded a song and converted to mp3, the cost of letting people download it is almost zero. So they can put their fans on the honor system with a “name your own price” proposition. And that way, they create more goodwill and find more fans, because the promotional value of having their songs widely distributed far outweighs what they can get by restricting access and attempting to charge premium prices. It’s much better to attract bigger crowds for concert, to sell more souvenir T-shirts and otherwise profit from an expanding fan base. The music label model worked when fans had few options for hearing new music (FCC-limited radio station licenses.) Now, with the web enabling anyone to distribute music directly to consumers, the value added by the labels is declining. Sure, they have promotional power, just as the mainstream media do. Both mainstream media and music labels are still the biggest things going. Most artists would love to have a recording contract with a label, and mainstream media enable you to reach a mass audience to which only the most contagious viral phenomena can spread. But just as the mainstream media have lost their oligopoly and therefore are seeing continual declines in audience and circulation, so will the music labels see their market share dwindle in the new world of democratized media.